When we think of Scotland we envision the rolling hills and pristine valleys with sheep and little villages. It is not surprising that this country takes great pride in the natural beauty of their land, air and streams. Scotland has taken charge of their own destiny and may soon be one of the highest ranking environmentally clean countries in the world. There are very clear plans in Scotland to generate all of their electricity by renewable energy sources by the year 2020. They have already been ahead of the game by generating 27 percent of their electricity in 2009. They started quite a bit earlier than many countries with their vision and use of tidal power. Scotland is a natural source of the best tidal and wave power in all of Europe and have been using tidal power in a plant in Kinlock Rannoch, Perth. There are new plans abrewin’ in Scotland, though; and these are quite grandiose. The goal is to provide new energy sources and keep in balance with nature and their beautiful lands. The first step made was an announcement by the Scottish government to place a moratorium on the building of any further nuclear power plants. Residents are breathing a sign of relief on that decision and they are all eager to move forward in the next steps. The Scottish government has also given approval on the newest hydro-electric power project which will be located in the Highlands. This will be a 5 megawatt system with the expected delivery of renewable energy to approximately 2,400 homes. The plan also includes the well needed refurbishing of the existing hydro-electric power plant in Perth. This plan is so well received throughout Europe that there were special documentary programs presented on the BBC (British Broadcasting Channel). The design is not without its problems, though. They had originally contracted with RWE, a German power company for the construction of the 4 mw Siadar Wave Energy Project, at the Isle of Lewis. When RWE decided to back out of the project, this created a bit of a financial whirlwind for the investors. The Scottish are not to be trifled with because once they get an idea started, they see it through to the end. The Scottish government is working with specialists, scientists and financial advisors to utilize both large and small scale microsystems across the country for renewable energy via wind, tide and wave sources. The purpose and plan is to reduce carbon emissions to zero and to eliminate their dependency on any fossil fuel for power. They are also working closely with environmental specialists in every step of every plan, to ensure that any change will not affect the ecological balance of an area. Additional research is being done to combine all efforts to also incorporate biofuel efficiency as complimentary services with other projects. Scotland is not only a country that should be applauded for their efforts, but will be one that is looked to as an example for other countries to follow for eco-friendly and renewable power sources. 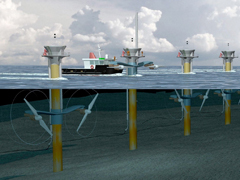 Effective Renewable Energy System - Ocean Thermal Power Plants! Posted on February 17th under Alternative Sources of Energy, Hydro Energy.